Well I’m going to start off by saying that this here, has to be one of my favourite examples of crossover R&B and Ska! It moves, and it shuffles, and oh just so nicely! Tenor Sax extraordinaire Earl Swanson and his Trini-dads are killing it here on this one off 1964 recording, but actually this band of merry men is one of many incarnations of producer Frank Guida and his Legrand Records house band, The Church Street Five. Guida owned a number of record labels, including Le Monde (distributed by Atlantic), then Legrand (home to many early sixties hits by Gary U.S.Bonds) and finally sister label S.P.Q.R. (distributed by London). Guida was of Italian extraction and while stationed in Trinidad during the Second World War, he fell under the influence of calypso, an obvious influence passed on in many of his productions. Much of the Gary U.S. Bonds sound was created by the Church Street Five (based in Virginia), featuring Gene “Daddy G” Barge and Earl Swanson on the earlier cuts. The Church Street Five also featured Ron “Junior” Fairley on bass, Willie Burnell on piano, Leonard Barks on trombone, Eric Sauls and Wayne Beckner on guitar, and Melvin Glover and Nabs Shields on drums. Everybody Do The Ska is the flip, and it’s a much more traditional ska-reggae composition that really is out shined by Back Slop! 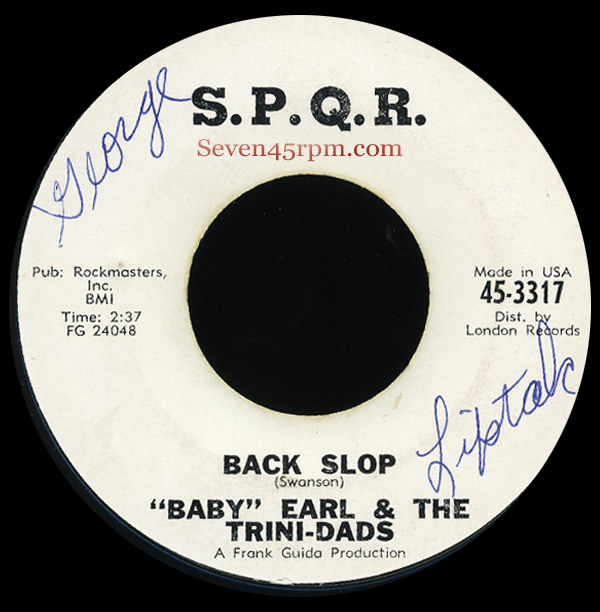 While Jamaican ska was originally influenced by the sound of American R&B and jazz picked up in Kingston from radio broadcasts in New Orleans and Miami, the sound of early 60’s ska also had an impact on American pop music of the same era. And here is the what can happen when both these beautiful styles marry. This uptempo instrumental is really hot stuff. The ripping guitar blues solo, the Baby Earl grooves, the constant but addictive rhythms, mixing boogaloo with soulful ska, it’s made strictly for the dance floor! Other facts: Guida opened a record store in Norfolk, Virginia, named Frankie’s Got It in 1953 (it’s motto was Shakespeare’s “If music be the food of love, play on!”, which later became a song on a Bonds B-side). SPQR is the abbreviation for the Latin, Senate and Citizens of Rome, emblem of the Roman Empire (Senatus Populesque Romanus) and may have been a nod to Guida’s family’s original home, but it may have also stood for Sound Proof Quality Records. 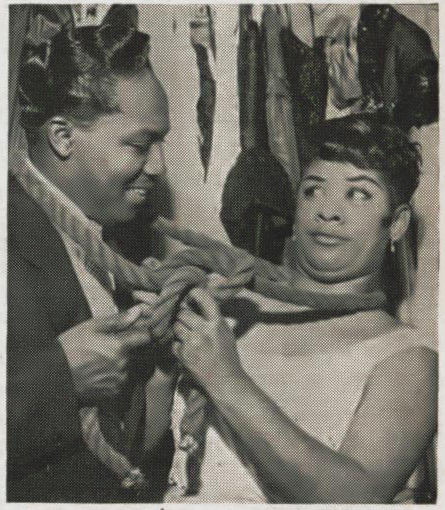 In 1955, Ruth Brown met Swanson on the Griffin Brothers Orchestra tour and soon married, but sadly Swanson was not a nice husband at all! He was a womanizer, drug user and a wife beater, and made Brown’s life hell (you can read in more detail of the relationship here Icons of R&B).